This month, I surprised my nine-year old daughter with a subscription to the new magazine Kazoo, billed as a publication for “girls who aren’t afraid to make some noise.” I haunted our dusty red mailbox every day in October until her issue arrived, and managed to slip it out of her room one night after she’d fallen asleep reading it. Fellow Nature Nerds, it rocks. In issue #2, you’ll learn how to make beautiful self-portraits out of leaves and sticks and flower petals and lichen found outside. You’ll study the science of composting to enrich the soil, learn how to make an acorn whistle, examine a butterfly wing up close, and create a pinhole camera with which to document your adventures outdoors. Don’t miss it. If I hadn’t started homeschooling my daughter last year, I would never have discovered a wonderful new online resource called Mystery Science. Each short lesson begins with an entertaining anecdote and moves into information and–my favorite part–experiments! Over the past few months, my daughter and I have learned why some apples are red, some are green, and some are yellow. We’ve investigated whether we could outrun a dinosaur and whether or not a volcano could appear spontaneously in our backyard. Thanks to the smart people at Mystery Science, we know what happens to fallen leaves, why a hawk might move to New York City, how to identify clouds and track a storm and and tell the time using only the sun and a paper plate and a pencil. Each short lesson concludes with a page of links and films and books for further study. Science this exciting is addictive! I’m a sucker for a colorful nonfiction kids’ book, especially if the author can explain in a clear and entertaining manner certain tricky concepts like how to navigate without a compass, and mark a trail, and tell whether a storm is coming. I found this book at our local science museum, and I’ve read it over and over, both alone and with my daughter. It’s a fun book, packed with useful information. We learned how to make spider dogs and solar oven pizza, how to make seed jewelry, and how to tell a rabbit track from a garter snake track (okay, that one was easy). Too cold to camp right now? This book makes for great winter reading while you plan your next adventure. Check out Camp Out here! These are just a few of my favorite nature resources. I’d love to know yours! Feel free to comment below. Melissa Hart is a contributing author at The Writer Magazine and the author of the middle-grade novel, Avenging the Owl (Sky Pony, 2016). Categories: media resources, nature, nature crafts, Uncategorized | Tags: Avenging the Owl, Books, Camp Out!, camping, crafts, environmental education, experiments, gardinging, girls, hiking, homeschool, homeschooling, Kazoo Magazine, kids, Melissa Hart, Mystery Science, nature, outdoors, science, science education, STEM, sustainability, tracking | Permalink. You probably know Portland author Bart King from his books, The Big Book of Boy Stuff and the Big Book of Girl Stuff. He’s also written numerous other nonfiction books, and now, he’s got a novel! Titled The Drake Equation, it’s the story of birdwatcher Noah Grow, a boy who starts out on a quest to find a wood duck and ends up on an intergalactic adventure. On Wednesday May 4th at 7 PM, Bart King and I will host a family-friendly literary event at Powell’s Books at Cedar Hills Crossing . We’ll talk about his book, and about my new novel Avenging the Owl, then debate which bird is cooler–black swifts or great horned owls. Learn about birds with our slide show presentation and Avian Trivia game, and stay for our reading and book signing. This event is ideal for anyone who loves wildlife and wit. Melissa Hart: What is it about black swifts that intrigues you, and why did you want to include this particular bird in The Drake Equation? Have you seen these birds in person, and if so, where? Bart King: First off, I’ve never seen a black swift personally. Almost nobody has! They’re very rare, canny, and private. About two years ago, I read a short book about black swifts, and was amazed to discover this mysterious, rare little bird that nests behind waterfalls. So I imagined a young birdwatcher named Noah who thinks he *might* have seen a black swift. Melissa Hart: Tell me about your relationship to wood ducks. Bart King: In 1971, I was living in a small town in California called Sebastopol. It has wetlands on its east border (now known as the Laguna Wetlands Preserve), and wood ducks lived there. As a community project, I helped build and install nesting boxes for the birds. (Wood ducks are unusual in that they perch and nest in trees). Anyone who’s ever seen a wood duck knows how absolutely beautiful they are—and I’ve remained impressed ever since! Melissa Hart: Let’s say you have a whole weekend free to travel to your favorite spot in the Pacific Northwest. Where will we find you? Melissa Hart: Are you working on another book now, and if so, can you tell us a bit about it? I’ve also just finished a funny novel called Three Weeks to Live (Give or Take). Among other things, it’s a “SickLit” satire about a teen girl named Jackie who nearly gets hit by a meteorite in her PE class. (Her tennis partner is not so lucky.) Jackie finds herself becoming a reluctant celebrity—but she may not be around long enough to enjoy her new status. For more about author Bart King, visit his website at http://www.bartking.net/. And see him in person with me at Powell’s Books, Cedar Crossing, 7 PM Wednesday May 4th. Categories: Arts & Culture, birding, bookstore, nature, Oregon, Portland, Raptors, Uncategorized | Tags: Author, authors, Avengign the Owl, Bart King, birding, birds, birds of prey, black swifts, bookstore, children's literature, homeschool, homeschooling, humor, Melissa Hart, Middle-grade, middle-grade novel, nature, novel, Oregon, owl, owls, Pacific Northwest, PDX, Portland, Powell's Books, raptors, The Drake Equation, tween, wildlife, wood ducks, young adult novel | Permalink. Happy National Audubon Day! The National Audubon Society sets aside April 26 each year to celebrate the life of ornithologist and painter John James Audubon, author and illustrator of this gorgeous book, The Birds of America. You can find a chapter of the Audubon Society in or near your hometown and meet up with other bird lovers for hikes and educational meetings and the annual Christmas Bird Count. One of my favorite raptor rehabilitation centers is Wild Wings, in upstate New York. Here’s an article I wrote about it for The Boston Globe a while back. Enjoy! HONEOYE FALLS, N.Y. — Wild Wings is a national chain restaurant serving crispy, spicy drumsticks in barbecue sauce. Wild Wings is also a family-friendly raptor rehabilitation center just south of Rochester. Wild Wings Bird of Prey Facility, at Mendon Ponds Park in Honeoye Falls, houses over 20 raptors including eagles, owls, hawks, falcons, and a vulture. Most of the birds were hit by cars and have permanent injuries ranging from vision loss to damaged wings; they cannot be released back into the wild. Kozakiewizc makes the raptors available for public viewing five days a week year round, hoping to foster awareness and increased respect for birds of prey. Watching a barred owl soar through the sky is exciting indeed, but getting to see Hunter, Wild Wings’ fluffy resident barred owl, close-up on her perch inspires me to drive more mindfully. The facility offers educational programs and guided tours. Participants can dissect owl pellets or paint a portrait of a live raptor on its perch. 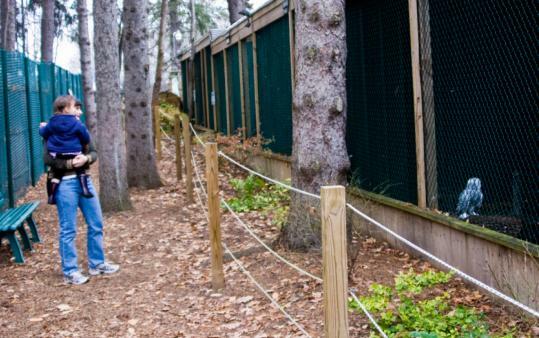 Visitors can stroll along Bird Song trail to feed chickadees, then step into Wild Wings’ colorful Cottage Store with its avian-themed gifts. Just out the back door, a tidy outdoor compound of wood and wire cages houses stately red-tailed hawks, diminutive Eastern screech owls, bald and golden eagles, and an elegant black-spotted snowy owl named Pearl. Each enclosure gives the raptors numerous perches and room to move about, even to take limited flight. Volunteers have paid close attention to each species’ needs — brightly-colored hanging toys tempt the curious crow, and a pile of low stones provides a perfect seat for the tundra-nesting snowy owl. My daughter was most enamored of Wild Wings’ resident bobcat, who roused herself from a nap in a bed of straw and dashed up to the fence. Tara, captive-bred and declawed, lives in a spacious cage with ramps and bridges for roaming. But while we stood there, her amber eyes remained fixated on my child. “She sees her as a toy, hon,’’ Kozakiewizc told me, and so we retreated into the Cottage Store for hot cocoa, coffee, and cookies. Kozakiewizc explained that Wild Wings is a family affair, and that she’s the only paid employee. “My husband builds enclosures for the birds, and my son Nick does a lot of the educational programs for kids.’’ She pointed to a grinning young man helping to restock a shelf with child-sized footballs in the shape of bald eagles and furry leopard-print purses. Their affection for each bird is palpable. Kozakiewizc recounted the recent death of Shasta, a 25-year-old red-tailed hawk. “I’m so glad he died before he had to be cooped up for the long winter,’’ she said, and went on to relate the story of how, for the past three years, a wild red-tail had brought freshly-caught squirrels to the aging Shasta, continuing even after his fellow hawk died. Fri-Tue 10 a.m.-2 p.m. Free; donations welcome. Categories: birding, family travel, Family Volunteering, New York, Raptors, Uncategorized | Tags: Audubon, Avenging the Owl, birding, birds, birds of prey, children's librarian, creative writing, environmental writing, family adventure, family travel, Hawkwatch International, Honeoye Falls, International Wildlife Rehabilitation Council, kid lit, librarian, Melissa Hart, Middle-grade, middle-grade novel, National Audubon Day, National Audubon Society, National Wildlife Rehabilitators Association, nature, nature book, New York, novel, owls, raptor rehabilitation, raptors, Rochester, Sky Pony Press, The Birds of America, The Peregrine Fund, travel, travel writing, tween, Wild Wings, wildlife, wildlife rehabilitation | Permalink. Banana Slug Slip ‘N’ Slide! I knew I didn’t want to make a traditional book trailer. Typically, a book trailer’s a short video preview of one’s new novel or work of nonfiction or poetry. I’d made one for each of my previous books which, while quirky, followed a narrative about the stories I’d published. But my new book, Avenging the Owl (Sky Pony, April 2106) is my debut middle-grade novel about a 13-year old boy who’s essentially saved by Pacific Northwest flora and fauna, so I wanted to create a video in celebration of nature–a quick documentary that would entertain viewers and teach them something. My husband and daughter and I teamed up to create a three-minute documentary/promotional video for Avenging the Owl. I wrote the script and created a storyboard. Jonathan (who’s a professional photographer) filmed, and our kiddo provided sound effects and some physical comedy along with me. We spent several winter mornings hiking through Mount Pisgah Arboretum in Eugene, searching for banana slugs. Finally, we found one in the long grass under Douglas firs. The slug became our movie star for 24 hours, and then we returned it to the spot in which we’d discovered it, right next to the Coast Fork of the Willamette River. For super-cool information on banana slugs, I relied on a brilliant nature guidebook written by Patricia K. Lichen. All of her titles sit on our living room bookshelf. Next up, we’ll be working on a three-minute documentary about owl pellets. Stay tuned, Northwest Nature Nerds, and stay outside! Categories: nature, Oregon, Uncategorized | Tags: Author, Avenging the Owl, banana slug, book, book trailer, cat, creative writing, David Gessner, Eugene, Eugene Oregon, hiking, humor, Melissa Hart, middle-grade novel, Mt. Pisgah Arboretum, nature, new release, nutria, Oregon, Pacific Northwest, Patricia K. Lichen, Sky Pony, Ted Gesing | Permalink. BELLINGHAM, Wash. – Travelers of all ages rushed with their stuffed backpacks to the top deck of the M/V Malaspina to secure a camping space in the open air. For years I had gazed at a Sunset Magazine clipping on my bulletin board describing adventurers pitching tents on the Alaska Marine Highway ferries. Now, my husband and I were on a three-day voyage along the Inside Passage from Bellingham to Juneau, Alaska. Since 1951, eleven ferries – the largest of which accommodates 499 passengers – have traveled 3,500 miles of routes along the marine highway. These comfortable ships venture as far south as Bellingham and as far north as Skagway, Alaska, with port stops in between. For many Alaskans, the ferries are a primary source of transportation between small, hard-to-reach coastal towns. My man, Jonathan, roughing it on the ferry. This piece originally appeared in The Boston Globe. –From May to September the Alaska Marine Highway ferry leaves from Bellingham, Wash., every Friday at 6 p.m. and arrives in Juneau, Alaska, on Monday morning with several port stops along the way. Top deck $326, cabins $308-$533. Bicycles/inflatable kayaks/cars for additional cost. For reservations and maps, visit www.dot.state.ak.us/amhs/index.html. ~~~~~~~~~~~~~~~~~~~~~~~~~~~~~~~~~~~~~~~~~~~~~~~~~~~~~~~~~~~~~~~~~~~~~~~~~~~~~~~~~~~~~~~~~~~~~~~~~~Interested Interested in taking a writing class with me or coming to a reading of my memoir, Wild Within: How Rescuing Owls Inspired a Family? See my July sched ule, below! July 17th, 2015—Reading/Discussion of Wild Within, Paulina Springs Books, Sisters, OR, 6:30 PM. July 18th, 2015—Reading/Discussion of Wild Within, Paulina Springs Books, Redmond, OR, 6:30 PM. July 25th and 26th, 2015–“Heal Yourself Through Environmental Memoir,” Sitka Center for Art and Ecology, Otis, Oregon, 10 AM-4 PM both days. Three spots left–still time to register! Categories: Alaska, backpacking, camping, Washington | Tags: adventure, Alaska, backpacking, camping, family adventure, family travel, ferry, nature, Pacific Northwest, raptors, summervacation, travel, Washington, Wild Within: How Rescuing Owls Inspired a Family, wildlife | Permalink. I’m not a Mother’s Day brunch kind of gal. Give me a river, a kayak and a beach full of tidepools–I’m good to go. A carving station? Not so much. My husband, knowing better than to sit me down in front of an all-you-can eat seafood bar, researched the Siuslaw Estuary Water Trail near Florence, Oregon. “It’s an adventure!” he told me and our 8-year old daughter (aka The Spud). We presented our new dog, April, with a terrier-sized life vest and headed west. You’ve got two choices when you park at Bender Landing at low tide; you can either slog with your kayak through knee-high mud and drop it in the water, or you can rig a line 10 feet up on a retaining wall and lower your boat and climb down a metal ladder to the river. Either way, you’re guaranteed awkward hilarity. We opted for the ladder, lowered our paddles and peanut butter sandwiches and the terrier, and started off laughing and unmuddied upstream. Paddlers on the Siuslaw can kayak 30 river-miles between Mapleton and the Pacific Ocean. It’s pretty country, I decided, but nothing beats kayaking the Siltcoos River 14 miles south. That’s my true love river, with its old growth and sand dunes that give way to Snowy plover territory and the ocean. We turned our boats around after a while, observed by a preternaturally calm egret, and paddled with the tide. Heading south on the North Fork of the Siuslaw, you’ll see farms in the distance, and tractors and horses. We spotted more egrets sailing overhead, and vultures, and what looked to be a Northern harrier skimming the fields. Nutria emerged at the shoreline and scuttled off into tall weeds. Below us, fallen trees stretched out in the water with delicate plants all around them. On this sunny Mother’s Day weekend, the water felt warm enough for a swim. The Spud jumped in to the delight of our new terrier and splashed around a while. It’s possible to kayak to Old Town Florence and tie up in pursuit of a scoop of BJs Oregon Trail ice cream. But we had some serious tidepooling to do, and so we paddled back to our put in and circled around the ladder and the muddy shoreline, weighing our options. Not willing to drag my kayak one-handed up the ladder, I got out on the shore and sunk immediately up to my knees. A pristine kayaker, preparing for a paddle, gaped at me from a picnic table on the grass. “That the only way in?” he asked. I nodded at the narrow metal ladder and broke into laughter at the sight of my husband mired in the mud. Our giddy giggling continued later when we walked down to the beach outside the Adobe Resort and discovered two people in the distance gathering up something in bags. A budding journalist, The Spud ran over to investigate. I’d spotted five-inch long translucent jelly-like tubes on the beach. Confused, I decided these were maggots of some sort, and the couple had found use for them. I wanted to know just what that use was. Not maggots . . . squid eggs. “What are you collecting?” I asked with a bemused smile. The man who replied gave me a sober look. Turns out this beach, like Bob Creek Wayside a few miles south, offers agates the size of fingernails and fists. The latter, he said, can be worth hundreds of dollars which accounts for the beachcombers who show up hours before low tide to start searching. Those five-inch long jelly-like things? Apparently, they’re squid eggs flung by ocean waves to land among the velella velella (By-the-Wind Sailors). Here, read this! By day’s end, I had mud between my toes and tiny amber agates in my pockets. I had the memory of a terrier in a life vest, a child in the river, and a lunch to look forward to the next day at our favorite Mexican food restaurant, Los Compadres in Florence. A very fine Mother’s Day, indeed. I’m teaching a two-day workshop 7/25-7/26 titled “Heal Yourself through Environmental Memoir” at the lovely Sitka Center for Art and Ecology near Lincoln City, OR. There’s still time to register; I’d love to work with you! Categories: Kayaking, Oregon, Oregon coast, tidepooling | Tags: Adobe Resort, beaches, birding, coast, dog, dogs, family adventure, Florence Oregon, kayaking, Lincoln City, marine biology, Melissa Hart, Mother's Day, nature, Oregon, Pacific Northwest travel, Sitka Center for Art and Ecology, Siuslaw Water Trail, tidepools, travel with dogs, wildlife, WildWithin, writing, Yachats Oregon | Permalink.